Research Publications: Results of Sphagnum Restoration Trials on Lodge Bog, Lodge Management Plan and Results Results of Drain Blocking works on Lodge Bog. The IPCC can accept no liability for injury to persons visiting the site. Lodge Bog is a raised bog of immense biodiversity value in the Irish midlands. It supports raised bog habitat and the associated wildlife which were once very widespread in this region of the famous Bog of Allen, but which now have been lost on a large scale duel to peat extraction. Lodge Bog is made from water, peat and vegetation. All three components are strongly interconnected. If any one of them is removed, this threatens the future of the site and its wildlife. Raised bog habitat is a conservation priority within the European Union. Lodge Bog is 35ha in size and it began to grow 10,000 years ago. A raised bog gets its supply of water and nutrients from rainfall which is a poor source of the minerals needed for plant growth. There is so much water in Lodge Bog that the natural process of decay is impeded and the partially rotted plant remains accumulate as peat. It is very exciting to walk on the bog surface and feel it move as you compress its watery depths with your footprints. The surface of Lodge Bog is not flat. It is bog surface is not flat. It has drier sections that are called hummocks and wetter sections called hollows. Water gathers in the hollows and they are then known as bog pools. Different plants have adapted to live in the wet and dry areas. On Lodge Bog 150 different plants are found including mosses, heathers, sedges and lichens. As you walk along the boardwalk you can see two areas enclosed. 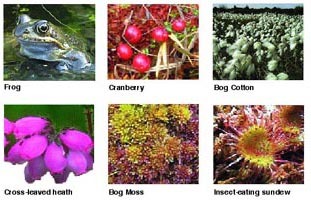 These are examples of wet and dry bog. Looking at the dry section you see that Heather is dominant with Feather Moss and Bearded Lichen common. Heather has narrow waxy leaves to help it survive the dry, hot conditions at its roots. These small leaves help to reduce the amount of water evaporating from them. Looking at the wet section you see that the common plants here are Sedges and Sphagnum Moss. Sedges such as Many Headed Bog Cotton have air spaces in their roots which allow them to breathe in the waterlogged conditions. Sphagnum Moss is called the bog builder. It can hold twenty times its own weight in water and grows upwards giving the landscape the raised appearance. It can grow as much as 12cm in one year. Round Leaved Sundew is one of the carnivorous plants found on Lodge Bog. You will find it growing along the edges of the bog pools and drains. Carnivorous plants have adapted to the nutrient poor peatland by trapping insects with their leaves and releasing digestive chemicals to digest the insects allowing the plant to absorb the nutrients from the insect’s body. Wildlife of Lodge Bog, Co. Kildare. Lodge bog is a home or habitat to 186 different birds, mammals and insects. There are 47 different species of spider alone found on Lodge bog. Hypsosinga albovittata was discovered on Lodge Bog for the first time in Ireland. It is a member of the family of Orb Web Spiders. The Mountain Hare and Fox are residents of Lodge bog. Looking out over the bog you may not see them but signs to look out for would be their droppings. The Fox always places its droppings on an elevated spot so that the scent can be passed in the wind to mark it’s territory. Hare droppings are straw coloured balls with lots of remains of sedges. 59 moths and 13 butterflies are found on Lodge Bog. Sometimes you find the silk pupal cases of the Emperor Moth in the Heather. The bog pools and drains are home to many of the nymphal stages of the dragonfly of which there are 10 species. Birds found on the bog include Meadow Pipit, Kestrel, Common Snipe and Skylark. It is not always possible to see these birds but if you take a moment and listen while on the boardwalk you will hear many of them. In Spring it’s lovely to hear the cry of the Curlew on Lodge Bog. Lodge bog was donated to the Irish Peatland Conservation Council by Bord na Móna in 2005. Through the years Lodge bog has been used regularly for school visits and training programmes. Each footstep on the bog surface takes three years to disappear. As a result trampling damage can be seen as you enter onto the boardwalk. The visible effects of visitor trampling include peat compaction, drying of peat and a change in vegetation communities with a loss of Sphagnum Moss and Heather and a dominance of bare peat and deer sedge. As you look across the bog towards the Hill of Allen you can clearly see the chocolate brown colour of the commercially developed peatland. Peatlands are waterlogged habitats and as a result it is necessary to drain the peatland for large excavating machinery to remove the peat. Drains have been opened along the boundaries of Lodge Bog. 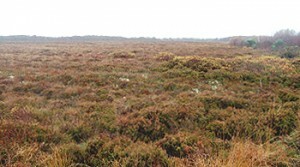 The bog along the drains has significantly dried out resulting in the loss of Sphagnum Moss, the enlargement of the Heather bushes and the invasion of birch trees. 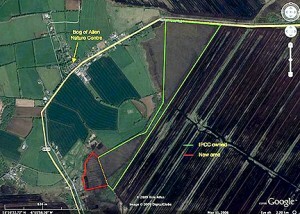 The Irish Peatland Conservation Council have prepared two conservation plans for Lodge Bog in 2005 and in 2011. The aim of the 2011 plan is to enhance and maintain Lodge Bog so that it is a fully functioning, self-regulating raised bog ecosystem (see Lodge Management Plan). In 2005 the IPCC constructed a boardwalk on Lodge bog to help reduce the impact of visitor trampling on the site. The boardwalk is 95m long and 1.5m wide. It is made from tannalised spruce timber. It is a floating structure, held 40cm over the bog surface by a series of supporting uprights. 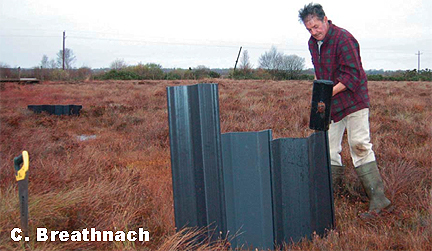 In 2005 a Dutch scientist installed 40 piezometers on Lodge Bog to determine the status of water levels in the bog. Ideally for active raised bog habitat to grow the water level needs to be within 10cm of the surface. With the extensive drains on Lodge Bog the water level in some instances was at a depth of 1m or more! So from 2006 to 2009 IPCC began the work of raising the water level of Lodge Bog. To do this IPCC volunteers blocked 4km of drains on the site using recycled plastic lumbar and peat. Water levels are monitored each month in the piezometers and the drain blocking work has helped to raised water levels. It is vital that we continue this work to ensure Lodge Bog has a long-term chance of survival. You can read about the success of drain blocking with this link: Results of Drain Blocking works on Lodge Bog. Inserting a dam into a drain on Lodge Bog, Co. Kildare using plastic lumbar called Geoflex. The individual sheets interlock to form a watertight barrier in the drain. Looking along the road you will see trees growing on the bog. IPCC volunteers remove trees colonising the open bog as they disrupt the water table by intercepting 30% of the rainfall reaching the bog. They also cast shade preventing the typical bog plants from growing. In 2009 on the south western part of Lodge Bog IPCC began trials of Sphagnum moss regeneration on a bare peat surface. The methods we are using were developed by Canadian peatland managers. They involve raising the water level to within 10cm of the bog surface through drain blocking, removing the surface skin of oxidised peat and spreading Sphagnum moss fragments on the newly exposed peat. The trials have yielded results and have helped IPCC to adapt the Canadian method to the Irish situation. 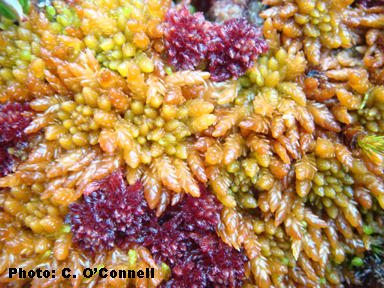 Click this link if you would like to learn more about Sphagnum restoration management techniques. IPCC have had great success with the Sphagnum restoration work on Lodge Bog and you can read about the Results of Sphagnum Restoration Trials on Lodge Bog by using this link. Dumping of rubbish and personal items is prohibited as they damage the bog and spoil the environment. Walking pets, camping, fires and the use of motorised vehicles on the bog are prohibited as they disturb wildlife. It is an offense to feed or molest wildlife or remove or otherwise disturb any natural feature or plant on the bog. It is dangerous to walk on the bog surface owing to hidden ditches, soft ground, tree stumps and brambles. Please use the boardwalk provided. 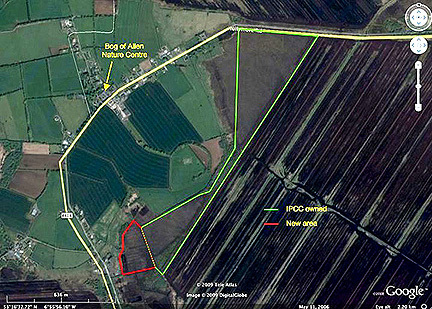 If you would like to support IPCC’s management work on Lodge Bog please follow this link. The creation and management of the Lullymore West Wildlife Reserve by the IPCC is supported by the following: IPCC’s Friends of the Bog, Kildare County Council, Vodafone and Conservation Volunteers Ireland, the Heritage Council under the Biodiversity Fund 2006, the Patagonia Fund of Tides Foundation, the Adobe Fund at the Community Foundation for Ireland and KELT and the LEADER Plus Programme which is funded by the Irish Government and part-financed by the European Union under the National Development Plan 2000-2006.